Controversy about implementing new mammography guidelines shouldn't cloud talks between doctors and the women they counsel. Clarify what the guidelines really say, and share the decision-making with patients, experts counsel. To encourage primary care careers, medical schools are offering students shortened specialty rotations in favor of fast-track graduation, half-tuition forgiveness and having students follow patients wherever they go in the health system. Different teaching models emphasize continuity of care over snapshots of diagnoses, and place students in the clinics where they can fulfill the nation's need for rural care. Little data supports the use of genomic testing for subjects such as warfarin dosing. 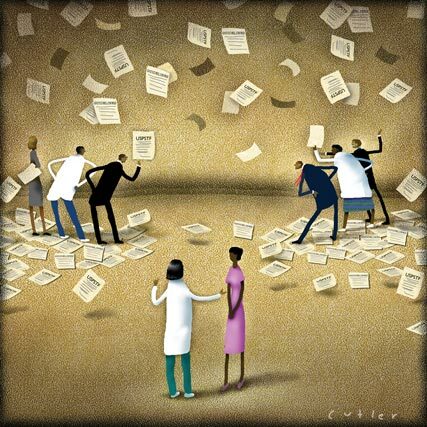 Paradoxically, that lack of evidence leaves open the potential for the misuse of direct-to-consumer genomics tests for fun, or for their premature adoption by clinicians. A reader offer support for the evidence base for nutritional supplements, while another cites anecdotal evidence on the benefits of fasting. Mammography screening guidelines by the U.S. Preventive Services Task Force set off a firestorm of controversy. But now that the flames have subsided, doctors need to know what to tell their patients. Every Congress has made its mark on Medicare since the program's inception in 1965. Success or failure for health care reform isn't the end of the journey, but another milestone. True North Health Center in Maine surveyed every patient who came through their doors from March through May last year to let each if its 28 practitioners know outcomes for each provider. Proprietary surveys are expensive, so they turned to ACP's tools. The results helped those performing best to teach their peers about best practices. CMS stopped recognizing CPT consultation codes and issued instructions to physicians only a few days before the new policy took effect. ACP's practice management staff digest what internists need to know to stay atop of billing for 2009, documentation, the “3-year rule” and cross-walks for services previously billed as consultations. Practice not currently considering the patient-centered medical home model can still position themselves for an eventual transition if and when the idea comes of age. John J. Hoesing, FACP, and Stephen M. Ayres, FACP. February is National Heart Disease Awareness Month, and the field is wide open to controversies seemingly without resolution when it comes to invasive versus therapeutic regimens. A 30-year-old woman is evaluated in the emergency department of a community hospital for a 2-week history of fatigue, malaise, low-grade fever, and intermittent epistaxis. Her husband states that she has been forgetful and occasionally confused during this period. Physical examination reveals bruises over the upper and lower extremities and palatal petechiae. Laboratory studies indicate a hemoglobin of 7.2 g/dL (72 g/L), leukocyte count of 9600/##mu;L (9.6 ##times; 109/L), platelet count of 12,000/##mu;L (12 ##times; 109/L), and serum lactate dehydrogenase concentration of 1700 U/L. The peripheral blood smear is shown. Plasma exchange is unavailable. What is the most appropriate next step in management?.